Sorry, not really a busy week, just a lazy one. Something about anticipating a three-day weekend that makes me really unmotivated. If you noticed, I was in here Tuesday to post an updated weigh-in. I was down .2 pounds for the week, coming in at 129.2. I'm happy with the very small loss, but I was curious as to what was going on. I worked out a bit. Ate well and tracked almost everything. It occurred to me that since I started keeping track of my weight here, I haven't been doing it through Weight Watchers online. So, just before writing this post, I went over there, plugged in my weight, and sure enough, they are taking some of my beloved points away from me. I now have 19 points a day and 33 flex points for the week. (I used to have 22 a day and 34 flex points for the week.) It's kind of a big change for me. However, I'm almost excited for it. It's like the Weight Watchers honeymoon phase. It's a whole new challenge for me to conquer. Do I have the self-discipline to only have 19 points a day? We will have to see. I'm definitely motivated now to try and find out. It will mean some changes. I'm really going to have to make sure I track my food and points. I'm good at this during the week, but it's the weekends where I make mental notes of what I eat and inevitably end up forgetting how many points I ate. Of course this happens right before a holiday weekend when I was looking forward to relaxing with a few beers and being all loosey-goosey with points. 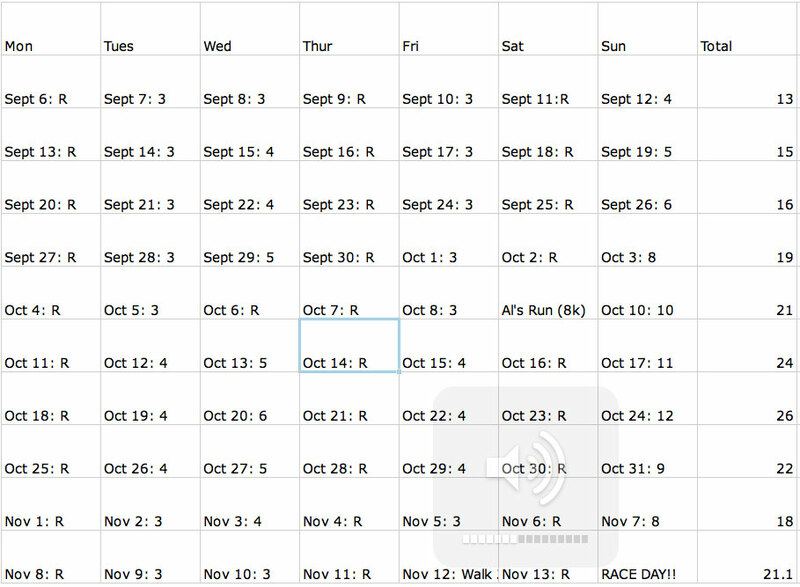 This week I officially start training for the half marathon I'm planning on running in November. 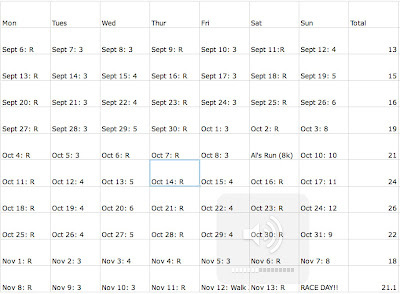 Here's a calender of my running schedule. You can click on the schedule to see a larger version of it. FYI: There's nothing important about Oct 14, it just happens to be where my clicker was when I took a screen shot of the Excel file. On Oct 9, I will be running an 8K road race. My company has a team and I joined. The race also has a walking group. I don't know of anyone from work running the race, so my friend Katie signed up and will be running it with me. It's just under half of a half marathon (half of a half, of a half, of a half), so it will be a good preview to running the half. My first week doesn't look so bad. It's not really out of the norm from what I do now. So, I have a feeling week 1 will go off with a hitch. Until next week, enjoy your Labor Day!